The scene at last year’s Osborn Easter Egg Hunt. This year’s event will take place Sat., Apr. 20. See “For Kids” for details. SPECIAL NEEDS: SELF-ADVOCATE SERIES. Irvington Town Hall Theater, 85 Main St., Irvington. 7:30 p.m. Free. Event will feature speakers who will discuss, in their own words, what it’s like to self-advocate and not only the challenges they face but the ways in which they are improving their own lives and the lives of others. Speakers will include Rachel Flamm, a Manhattanville College junior who was diagnosed with Williams Syndrome at 19 months old; Michael Gilberg who is on the autism spectrum and has years of experience as a special education and disability rights lawyer and advocate; Jiovante ”Joe” Guaba, a senior varsity football player at Sleepy Hollow High School who started as an athlete for the school’s Special Olympics Pioneer team; Brendan Klein who serves as the youth advocacy and engagement coordinator at the Westchester Institute for Human Development and Laura Mrugalski, a hard-of-hearing speech/language therapist who has worked with deaf and hard-of-hearing students at the New York School for the Deaf since 2012. For additional information go to www.irvingtontheater.com. MORNING FARM CHORES. Muscoot Farm, Rte. 100, Somers. 8-9 a.m. Help the farm staff do their daily chores and find out if you have what it takes to be a farmer. $6 per person; $20 for a family of four. Registration required at 914/864-7286. BYRAM MINI HEALTH FAIR. Byram Shubert Library, 21 Mead Ave., Greenwich. 9 a.m.-12 p.m. Free. Event offers a quick check on your health and provides an opportunity to learn about local resources. A Greenwich Hospital nurse will be on hand to answer general health questions and share information from the hospital’s educational display about colorectal cancer. Walk-ins welcome. For information call 203/863-4628. CITIZEN SCIENCE OPEN HOUSE. Trailside Nature Center, Ward Pound Ridge Reservation, Rtes. 35 & 121 S., Cross River. 12-3 p.m. Join to learn more about how you could help out at our local parks. Citizen science is both an educational and rewarding experience. 914/864-7322. SPRING ECOLOGY AND PLANT WALK. Edith G. Read Wildlife Sanctuary, Playland Park, Rye. 1-2:30 p.m. Find out what is going on in nature during this time of the year as you stroll the grounds of the sanctuary. 914/967-8720. VOLUNTEER WORK PROJECT: SPREADING GRAVEL AROUND THE PICNIC AREAS. Marshlands Conservancy, Boston Post Road, Rye. 1-3 p.m. Great for any type of service credit hours. Please bring work gloves; hand tools provided. 914/835-4466. ROLL IT OUT: YOGA TUNE-UP FOR SELF-CARE. Wainwright House, 260 Stuyvesant Ave., Rye. 1:30-3 p.m. This experiential workshop, led by Darcy Bowman, will offer a direct understanding of yoga and its healing power as well as an introduction to shamanic energy healing. $45 non-members. For information go to www.wainwright.org. YOGA AND THE LUMINOUS BODY. Club Fit, 584 N. State Rd., Briarcliff Manor. 1:30-4:30 p.m. Workshop with Ray Crist. $65 for non-members online at ytayoga.com; walk-in registration is $75 for non-members. STEEPING THE PERFECT CUP OF TEA. White Plains Public Library, 100 Martine Ave., White Plains. 2 p.m. Join Anupa Mueller to learn about tea—where it comes from, how it is manufactured and all its benefits. You will get tips on how to steep the perfect cup, the best way to store tea and the differences among the many types—black, green, oolong, herbal, chai and others. Bring your questions on tea—the most popular beverage in the world, second only to water. Every attendee gets a free tea sample. 914/422-1480. THE STORY OF JOSEPH KENNEDY. St. Paul’s Church National Historic Site, 897 S. Columbus Ave., Mt. Vernon. 2 p.m. Free. Author and historian David Nasaw explores the larger-than-life patriarch of the Kennedy family. Light refreshments will be served. The site is open today from 12-4 p.m. 914/667-4116; www.nps.gov/sapa. AFRICAN-AMERICAN BURIAL GROUNDS OF NEW AMSTERDAM. Croton Point Nature Center, Croton Point Avenue, Croton-on-Hudson. 1-3 p.m. Archeologist Eugene Boesch talks about the lost 17th and early 18th century African-American burial grounds discovered in 1991 in what is now lower Manhattan. Listen to the stories that these grounds tell about these people and their times. Sponsored by the NYS Archaeological Association/Lower Hudson Chapter program. 914/862-5297. INTRODUCTION TO MODERN CALLIGRAPHY WITH POINTED PEN. Wainwright House, 260 Stuyvesant Ave., Rye. 1-3:30 p.m. Beginner-friendly workshop. Explore the basics of modern pointed pen calligraphy—everything from how to prepare and use your pen, nibs and ink to learning the fundamental strokes, creating letterforms and connecting letters. A curated starter kit is included in the course fee and is yours to keep. $115 non-members. Register at www.wainwright.org. GONG BATH WITH KAT HIGGINS. Wainwright House, 260 Stuyvesant Ave., Rye. 1:30-3:15 p.m. Enjoy light minimal breath work and stretching before lying down for an exceptionally restorative relaxation to the healing sounds of the gong. $60 non-members. Sign up at 914/967-6080 or www.wainwright.org. THE NURSE IS IN. Rye YMCA, 21 Locust Ave., Rye. Today, Apr. 22 & 29. 9-11 a.m. and at the Greenwich Library, 101 W. Putnam Ave., Greenwich. 11:30 a.m.-1:30 p.m. Free. A nurse is onsite to take blood pressure readings and answer health questions. 203/863-4444. JOB SEARCH HELP. White Plains Public Library, 100 Martine Ave., Greenwich. Today at 3 p.m. and Wed., Apr. 17 at 7:30 p.m. Learn about websites, community resources and library databases to help with your job search. Session will cover Job Search on the library’s website, First Find, the White Plains Education and Training Center, the Department of Labor, WEBS, Learning Express, RefUSA, Lynda and MOOCs (massive open online courses). 914/422-1480. SELF-HYPNOSIS SKILLS FOR CANCER PATIENTS. Greenwich Hospital, 5 Perryridge Rd., Greenwich. Mondays, 3-4:30 p.m. Free. Learn from Kathleen Conway, APRN, a nurse and cancer counselor who has advanced training in hypnosis and is a clinical member of the American Society for Clinical Hypnosis. Initial consultation required. Register at 203/863-3704. MIND, BODY, FERTILITY YOGA. Greenwich Hospital, 38 Volunteer La., Greenwich. Every Monday, 5:30-7 p.m. and Wed., 6-7:30 p.m. Program is ongoing and is aimed at calming the body and mind for women trying to conceive. The class prepares the endocrine and reproductive systems to work as efficiently as possible. $25 drop-in fee per class. Register at 8888/357-2409 or go to greenwichhospital.org/event. MAH JONGG AND CANASTA NIGHT. Temple Sholom, 300 E. Putnam Ave., Greenwich. 7-9:15 p.m. Masters and novices alike are invited to join in the ancient game of Mah Jongg and the card game Canasta. $5 per person; $10 with an instructor. Hosted by Temple Sholom Sisterhood. RSVP required to 201/869-7191 or www.templesholom.com. BE FIT MALL WALKS. The Westchester, Bloomingdale Road, White Plains. Enjoy some window-shopping as you keep in shape during Mall Walks at The Westchester in White Plains. The program offers indoor walking at Westchester’s premier mall on Tuesdays and Fridays, from 8 to 10 a.m. throughout the year. A special guest speaker is presented on the first Friday of each month providing information on health issues, safety and nutrition. The talk takes place at 9 a.m.at the Level One Nordstrom’s E-bar seating area. Admission and parking are free for all registered members of the mall walk program. To join, sign up at the Horse Fountain Plaza near Crate & Barrel on Retail Level Two, on Tuesday and Friday mornings during the program. 914/231-4645; www.westchestergov.com/mall-walking. THE NURSE IS IN. Greenwich Hospital, 5 Perryridge Rd., Greenwich. Today, Apr. 23 & 30. 10 a.m.-12 p.m. Free. A nurse is onsite to take blood pressure readings and answer health questions. 203/863-4444. MUSIC AND MEDITATION. Greenwich Hospital Chapel, 5 Perryridge Rd., Greenwich. Tuesdays 12:45-1:15 p.m. No meditation. A free weekly journey into deep relaxation using crystal singing bowls, flute, guitar and guided imagery. Walk-ins welcome. 203/863-4444. PARKINSON’S SUPPORT GROUP. Eastern Greenwich Civic Center, 90 Harding Rde., Old Greenwich. Today & Apr. 30. 1:30-3 p.m. Free. Today: Exercise with Miriam Shaw, RPT; caregiver support. Apr. 30: Learn and Share: Tips for Everyday Living. 203/863-4444. ADULT COOKING CLASS: PIZZA RUSTICA. Westchester Italian Cultural Center, 1 Generoso Pope Pl., Tuckahoe. 6:30-8 p.m. Neapolitan in origin, this savory pie filled with meats and cheeses is delicious and can be served either warm or at room temperature. Come join us in creating this magnificent dish just in time for Easter! Take home your personal pizza rustica and sample a slice with a hearty Italian wine! Presented by Taylor Wolf. $65 for non-members. Register at woccny.org. SAVING THE EARTH: ETHICS, HEALTH CARE AND THE COMMON GOOD. Fairfield University, 1073 N. Benson Rd., Fairfield, Ct. 7:30 p.m. Free and open to the public. Bellarmine lecture by Rev. Andrea Vicini, S.J., a pediatrician and a member of the Society of Jesus. He will speak about the most urgent challenges facing the survival of humankind and the flourishing of our planet. He will explore how our failure to address today’s most societal challenges could lead to dire consequences for our common home—the Earth—and for our ability to live on it. www.visitfairfield/edu/cs. SOUND MEDITATION. Greenwich Hospital Chapel, 5 Perryridge Rd., Greenwich. Every Wednesday. 12-12:30 p.m. Free. A weekly sound meditation group using the healing vibrations of the gong and flute. Walk-ins welcome. Greenwichhospital.org/events. COLONIAL HISTORY DAY. Philipse Manor Hall, 29 Warburton Ave., Yonkers. 12-3 p.m. Free. Be transported back to the 1700’s featuring historical craftsmen, including a blacksmith and Cavalry rider on horseback, historical music and crafts, colonial virtual reality programs and more. Presented by the Friends of Philipse Manor Hall, the Downtown/Waterfront BID and Yonkers Riverfront Library. HOW TO SELL YOUR PRODUCT. SCORE Westchester, 120 Bloomingdale Rd., White Plains. 1-3 p.m. Free. In this SCORE sales clinic, you’ll discuss the sales process, prospecting and sales stages with particular focus on interactive discussion to help with your sales issues. Learn how to be more comfortable and effective with selling and how to overcome the issues and obstacles you may be facing. Register at www.scorewestchester.com. SERIOUS ILLNESS SUPPORT GROUP. Greenwich Hospital, 5 Perryridge Rd., Greenwich. An 8-week session today-June 5, 2;30-3:30 p.m. This new group provides a supporting and educational environment for individuals with a serious illness. 203/863-4628. SPRYE EVENT: STORYTELLING TECHNIQUES. Wainwright House, 260 Stuyvesant Ave., Rye. 3-4 p.m. Free and open to the public. Members of the Rye Storytellers’ Guild will share traditional and personal tales and trade tips on storytelling techniques. Light refreshments will be served. www.sprye.org; 914/481-5706. SHOP & SIP THIRD WEDNESDAYS. ArtsWestchester, 31 Mamaroneck Ave., White Plains. 6-8:30 p.m. Every third Wednesday. Happy hour pop-up shopping experience Grab a drink, meet other art lovers and shop unique designer products on display. 914/428-4220. THE NURSE IS IN. Greenwich Hospital Auxiliary’s Thrift Shop, 199 Hamilton Ave., Greenwich. Today & Apr. 25. 9-11 a.m. Free. A nurse is onsite to take blood pressure readings and answer health questions. 203/863-4444. COMMON GROUND: FOOD JUSTICE & THE ENVIRONMENTAL COMMUNITY. White Plains Public Library, 100 Martine Ave., White Plains. 6 p.m. Share your thoughts about some of the toughest issues facing our country and listen to the opinions of neighbors and friends. This community conversation is hosted by the library and the League of Women Voters of White Plains. People of all viewpoints are welcome to participate in an atmosphere that is safe for everyone who attends. Share experiences, opinions and solutions to u nderstand how people in our area are actually affected by the policies, issues and events that we hear about in the news and media. Participants will be split up in small groups and paired with a table captain who will keep the discussion on track. Groups will be mixed up a few times during the event to maximize the number of people who interact with each other. There will be time for both dialogue and reflection. 914/422-1480. MARY CALVI TALK. Sarah Lawrence College, 1 Mead Way, Bronxville. 6:30 p.m. The news anchor and award-winning TV reporter for WCBS-TV will discuss how she uncovered a love affair between George Washington and heiress Mary Eliza Philipse while researching her book “Dear George, Dear Mary.” She wrote the book based on hundreds of letters, witness accounts and journal entries she compiled in three years of research. The book explores Washington’s first love, NY heiress Mary Philipse, the richest belle in Colonial America. BE FIT MALL WALKS. The Westchester, Bloomingdale Road, White Plains. Enjoy some window-shopping as you keep in shape during Mall Walks at The Westchester in White Plains. The program offers indoor health walking at Westchester’s premier mall on Tuesdays and Fridays, from 8 to 10 a.m. throughout the year. A special guest speaker is presented on the first Friday of each month providing information on health issues, safety and nutrition. To join, sign up at the Horse Fountain Plaza near Crate & Barrel on Retail Level Two, on Tuesday and Friday mornings during the program. Go to westchestergov.com/parks or call (914) 231-4645.Admission and parking are free for all registered members of the mall walk program. To join, sign up at the horse fountain plaza near Crate & Barrel on Retail Level Two, on Tuesday and Friday mornings during the program. 914/231-4645; www.westchestergov.com/mall-walking. THE NURSE IS IN. Hill House, Riverside, Ct. 10 a.m.-12 p.m. Free. A nurse is onsite to take blood pressure readings and answer health questions. 203/863-4444. 1ST NIGHT INTERFAITH MUSICAL SEDER. Temple Sholom, 300 E. Putnam Ave., Greenwich. 6 p.m. Join Rabbi Mitchell M. Hurvitz and special musical guest Sheldon Low for a tradition Passover seder for people of all faiths. $54 per adult; $18 per child 12 & under. Reservations and entrée selections are due by Fri., Apr. 12 to www.templesholom.com. SPIN ‘N’ KNIT. Hilltop Hanover Farm, 1271 Hanover St., Yorktown Heights. 11 a.m.-1 p.m. Beginners or experienced can gather in an informal atmosphere and be part of a monthly spinning and knitting group. No fee or registration for first-time attendees; $5 for each subsequent class. 914/962-2368. TREE APPRECIATION WALK. Edith G. Read Wildlife Sanctuary, Playland Park, Rye. 1-2:30 p.m. Tree names don’t explain why they are so important to our environment. Take a hike to find out why and what you can do to protect them. 914/967-8720. MARGARET STEELE MAGIC SHOW. Croton Point Nature Center, Croton Point Avenue, Croton-on-Hudson. 8:30-10:30 a.m. $6 per person. Registration required at 914/864-7286. CARETAKER AND ME: ALL ABOUT SHEEP. Muscoot Farm, Rte. 100, Somers. 11 a.m. & 2 p.m. Geared toward 4- & 5-year-olds accompanied by a caretaker, each session will focus on a specific animal and will include a story, brief walk and craft. $25 per session. Registration required at 914/864-7286. FAMILY FUN DAY. Tarrytown Music Hall, 13 Main St., Tarrytown. 10 a.m. Free and open to the public. Dance, circus arts, and theater arts, with music, spring-themed arts and crafts, healthy snacks, and many other fun surprises! No tickets required. www.tarrytownmusichall.org. FAIRY DOLL MAKING WORKSHOP. Pelham Art Center, 155 Fifth Ave., Pelham. 12 p.m. For ages 5-8. Make your dream come true by creating a 14” Bendable Fairy Doll with step-by-step personal instruction from Janine Logue. $35. www.pelhamartcenter.org. KIDS IN THE KITCHEN: CASSATEDDE. Westchester Italian Cultural Center, 1 Generoso Pope Pl., Tuckahoe. 12:30-2 p.m. All ages. Cassatedde are a Sicilian half-moon shaped pastry with a sweet filling, comparable to a mini calzone, that may be either fried or baked. Variations of these pastries are made all over southern Italy around Easter time. Join us as we have fun creating our own version of cassatedde! Please advise us of any food allergies upon registration. Presented by Taylor Wolf. $40 non-members; parent & child fee is $70. Register at www.wiccny.org. SCIENCE SUNDAY. Westchester Children’s Museum, 100 Playland Parkway, Rye. 11:30 a.m. & 1:30 p.m. Appropriate for ages 7+. What is DNA? Put on lab coats and goggles and extract DNA from strawberry cells. Using real laboratory equipment, students learn about genes and DNA while being guided through the scientific procedure of DNA extraction. Students can take their sample home as a souvenir. Included with museum admission----$7.50 per person; $6.50 for seniors; free for children under 1. 914/421-5050. “POETRY ON FILM” SPRING BREAK CAMP. The Picture House, 175 Wolfs La., Pelham. 9 a.m.-12 p.m. half-day program or 9 a.m.-2:30 p.m. extended day program. Poems are brought to life on film. Emerging filmmakers, young actors and developing wordsmiths will be inspired by different, well-known (age-appropriate) poems each day. Under the guidance of professional film educators, kids in grades K-2 and 3-5 will learn movie-making techniques, show off their acting skills and use their imaginations to create short films inspired by timeless prose. $60 for half-day; $90 for extended day for non-members. 914/738-3161; www.thepicturehouse.org. SPRING BREAK WORKSHOPS. Rye Nature Center, Boston Post Road, Rye. Line-up full of circuits, experiments and other fun activities. Dress for the weather and pack a lunch. 10 a.m.-2 p.m. Apr. 15: Did You Hear That Sound? Learn frog calls and bird songs. Discuss migration and who emerges in spring. Apr. 16: STEM Challenge. Children will develop team building skills as they work together to balance the whale watch, fit through the honeybee high rise and pump water through Rye-agra Falls. Apr. 17: Where Did That Rain Drop Come From? Learn how our watershed and Blind Brook are connected to the water cycle. Apr. 18: Circuits, Circuits, Everywhere. Explore the basics behind an electric circuit. What can you use as a power source? What happens if the circuit is incomplete? What materials conduct electricity? Children will even get a chance to make their own circuits. Apr. 19: Whose Eggs Are in That Nest? Children will learn to identify local bird eggs and nests and search for robin and Canada goose nests in the RNC forest. They will have the opportunity to create their own bird nest inspired by Rye’s common birds. Apr. 22: Let’s Celebrate Earth! Experienced environmental educators will help children differentiate between native and invasive plants that they will use to create wonderful pieces of natural art. Children will collect natural items including forsythia and daffodils. Pre-registration required. $80 per child per day for non-members. Register at 914/967-5150. 3RD ANNUAL COMMUNITY EASTER EGG HUNT. Latham Park, between Bedford & Prospect Streets, Stamford. 10 a.m. Presented by the First Congregational Church of Stamford. Don’t forget your Easter basket and a camera to take pictures with the Easter Bunny. Advance registration is required at www.fccstamford,org/events or 203/323-0200. ANNUAL COMMUNITY EASTER EGG HUNT. The Osborn, 101 Theall Rd., Rye. 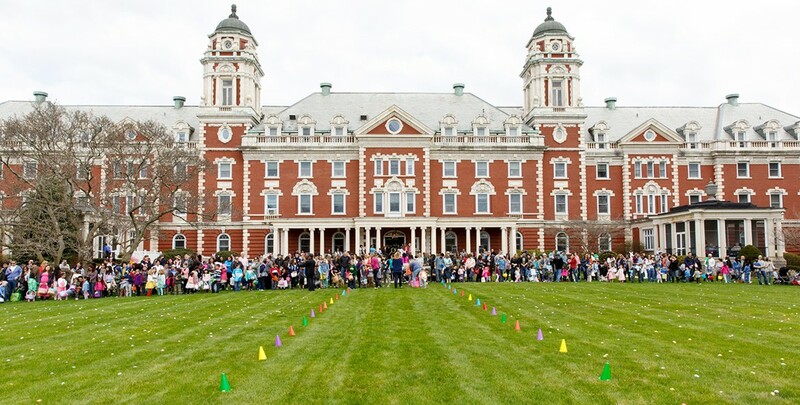 11:15 a.m. During the festivities, 6000+ Easter eggs will be hidden for children to find, gather and enjoy. Event is split into two groups—one for children under age 3 and the other for children over age 3. Event provides the opportunity for seniors and children to interact in a way many may not have the opportunity to do otherwise. Event also features a live DJ, dancing and games. Lunches, which include a hot dog, drink, chips and cookie are only $5, are available. Free and open to the public; no pre-registration required. For information call 914/925-8218 or visit TheOsborn.org. FAMILY GALLERY TOURS. Bruce Museum, 1 M-useum Dr., Greenwich. 11:30-12:15 p.m. This tour takes children 5 and up, and their caregivers, through the museum’s current exhibitions. While learning about the different exhibitions, families will be able to engage in conversations about the arts and sciences plus do interactives activities relating to the exhibitions. Free with admission to the Museum: $10; $8 for students ages 5-20 with ID; free for children under 5. www.brucemuseum.org. STORYTIME TUESDAYS. Muscoot Farm, Rte. 100, Somers. 1-1:30 p.m. Youngsters and their adults can enjoy stories every week at the farm. 914/864-7282. TODDLER TALES. Stepping Stones Museum for Children, 303 West Ave., Norwalk. Children join in an interactive storytime through song and movement followed by an art project. 10:30 a.m. open to all. 11 a.m. Cuentos para Ninos (Toddler Tales in Spanish). Unlimited participation for all ages. Free with museum admission--$15 for adults and children; $10 for seniors and free for children under 1. www.steppingstonesmuseum.org. MUSEUM MINIS. Westchester Children’s Museum, Playland Park, Rye. 10:30-11 a.m. Toddlers 18-24 months and parents/caregivers are invited for songs, moving and plenty of fun. Meet up in Toddler Beach for social play, muscle and brain builders, tumbling and jumping, music and instruments, dancing and story time. Group size is limited—first come, first served. Included with Museum admission--$7.50 per person; $6.50 for seniors; free for children under 1. 914/421-5050. MULTIGREES. Stepping Stones Museum for Children, 303 West Ave., Norwalk. 10:30-11:15 a.m. Enjoy a special canine storytime and discussion. Visit with a shelter dog as you learn about social and emotional skills. Shelter dogs courtesy of P.A.W.S. $15 for adults and children; $10 for seniors; free for children under 1. www.steppingstonesmuseum.org. WPPAC SUMMER THEATRE CAMP. White Plains Performing Arts Center, 11 City Pl., White Plains. Various programs beginning June 27. Along with sessions working on “The Lion King Jr.” and “Aladdin Kids,” WPPAC will be one of the first theatres to present “Frozen Jr.,” the one-hour version of the hit Broadway show. Three-, two- and one-week sessions are available for various age groups. Tuition is based on the length of the program and early registration discounts are available when registering on or before Apr. 15. To register or for additional information, go to wppac.com/education. TARRYTOWN MUSIC HALL ACADEMY SUMMER PROGRAMS. Tarrytown Music Hall, 13 Main St., Tarrytown. Bilingual Summer Workshop—El Rio (The River). June 24-28. For grades 5-8. 12:30-5:30 p.m. Explore theater through movement, music and Spanish verse. $420. Dance Day. July 1. Grades 3-6. 9 a.m.-3 p.m. No dance experience needed, just a desire to get up on your feet and find out what your body can do. $85. Improv Day. July 2. Grades 5-8. 9 a.m.-3 p.m. Learn the joy of thinking on y our feet. $85. Shakespeare Day. July 3. 9 a.m.-3 p.m. Grades 7-12. Academy Director Peter Royston leads kids in exploring the work of Shakespeare. Learn about stage combat, magic and the mysterious beautiful world of Shakespeare’s theater. No experience necessary. $85. Disney’s Frozen Jr. July 8-19. Grades 2-8. $840. Disney’s The Lion King. Aug. 5-9. Grades 2-5. 9 a.m.-3 p.m. $420. Circus Week. Aug. 12-16. 9 a.m.-3 p.m. Grades K-12. $420. Adventure Week. Aug. 19-23. Grades 2-5. Monkey King Rocks. 1-5 p.m. $280. Adventure Week: Greek Myths Come to Life! Grades 5-8. Aug. 19-23. 9 a.m.-1 p.m. $280. www.tarrytownmusichall.org. JUNE BUGS. Rye Nature Center, 873 Boston Post Rd., Rye. June 10-14, 17-21 and 24-28. Mornings 8:30 a.m.-12:30 p.m. (children should bring a hearty, healthy lunch in a reusable bag) or afternoons 1-4 p.m. (Children should eat lunch prior to coming to the program.) For preschoolers and kindergartners. Children ages 3.5 -6 will connect with nature through outdoor activities, arts and crafts, games and hands-on ecology lessons. They will spend time on the trails and get to know the menagerie of animals. With the indoor space available the program will run rain or shine. To register go to www.ryenaturecenter.org. SUMMER CAMP. Rye Nature Center, 873 Boston Post Rd., Rye. July 1-5 (no camp July 4); 8-12; 15-19; 22-26; 29-Aug. 2 and 5-9. Camp provides adventure and ecological exploration for preschool-7th grade. Must be at least 3.5 years of age to attend. Week 1: Scales & Tales; Week 2: Tracks & Bones; Week 3: Eco-Engineers; Week 4: Back country Bush Craft; Week 5: Small Bugs, Big Power; Week 6: Wacky Weather. For fees and to register go to ryenaturecenter.org. PADDLE ADVENTURE CAMP. Rye Nature Center, 873 Boston Post Rd., Rye. July 1-5 (no camp July 4); 8-12; 15-19; 22-26; 29-Aug. 2; 5-9 and 12-17. Mon.-Fri., 9 a.m.-4:30 p.m. For campers entering 8, 9 or 10th grade in the fall. This all levels camp is designed to introduce campers to the joys of kayaking throughout Westchester County. Goal is for participants to build paddling skills, confidence and an appreciation for the beautiful area where we live while maintaining a safe, exciting and fun atmosphere. $575 per session. Register at www.ryenaturecenter.org or 914/967-5150. MUSCOOT FARM’S YOUNG FARMERS. Rte. 100, Somers. For children in grades 1-8. Provides a unique experience that teaches children what life on a farm was like in the early 1900s in Westchester County. Plus there’s a Wranglers Camp for 4 & 5-year-olds. Programs are held in 1-week sessions in July & August. Registration begins Wed., Feb. 13 at noon. For information go to parks.westchestergov.com. SUMMER NATURE CAMPS. Cranberry Lake Preserve in N. White Plains, Lenoir Preserve in Yonkers, Trailside Nature Museum in Cross River and Marshlands Conservancy and Edith G. Read Wildlife Sanctuary, both in Rye. For children in grades 1-12. Program focuses on weekly themes to teach about animals, insects and plants. Sessions are offered in July and August. Online registration begins Fri., Feb. 15 at noon. For information go to parks.westchestergov.com. SLAM DUNK BASKETBALL CAMP. Westchester County Center, 198 Central Ave., White Plains. For kids in grades 3-8 as of Sept. 2019 who can hit the boards during one-week sessions in July. Players learn skills with emphasis on skill development, game knowledge and cooperative learning. Online registration begins Fri., Feb. 15 at noon. For information go to parks.westchestergov.com. SUMMER MUSIC CENTER. Westchester County Center, 198 Central Ave., White Plains.Six-week session runs July 1-Aug. 9 for children entering grades 4-12 as of Sept. 2019. Participants receive instruction in band and orchestral instruments, as well as keyboard, guitar and recorder. Online registration begins Fri., Feb. 15 at noon. For information go to parks.westchestergov.com. PERFECT PITCH AND SWING BASEBALL CAMP. V.E. Macy Park, Ardsley. For children ages 8-12. Provides training that uses unique and innovative methods, combining traditional baseball skills with disciplines from other sports. Daily schedule includes drills, hitting, throwing/pitching and games. Cam dates to be announced. Online registration begins Fri., Feb. 15 at noon. For information go to parks.westchestergov.com. HOLE-IN-ONE JUNIOR GOLF CAMP. Various GolfWestchester golf courses. For kids ages 10-17. Camp dates to be announced. For information go to parks.westchestergov.com. TAI JI QUAN. YWCA White Plains & Central Westchester, 515 North St., White Plains. 9:30-10:30 a.m. Practice and eventual mastery of 7 individual Tai Ji Quan forms adapted from traditional Chinese forms to enhance balance, strength, stability and ease of movement. 10-week session is $225 for non-members. For additional information call Angela Katz at 914/949-6227 ext. 208 or send an email to skatz@ywcawpcw.org. TUESDAY MATINEES. The Picture House, 175 Wolfs Lane, Pelham. 2:30 p.m. Seniors are free at 2:30 p.m. matinees. For film schedule log on to www.thepicturehouse.org or call 914/738-7337. Every Tues., Thurs. & Fri.
LIMBERCISE & ZUMBA. Wainwright House, 260 Stuyvesant Ave., Rye. 1 p.m. Free. Tues. & Thurs. : 45-minute Limbercise. Fri.: Zumba. Under the guidance of a certified Rye YMCA instructor. Register at 914/967-6363. SENIOR WEDNESDAYS. City Center 15: Cinema de Lux, White Plains. This program provides patrons with a chance to catch new movies at a price that can’t be beat. Tickets are $6.50 for ages 60 & up for all shows plus $3.50 for popcorn and soda. For additional information, log on to www.nationalamusements.com. OUR PLACE MEMORY CAFÉ. North Street Tavern & Wood Fired Pizza, 1128 North St., White Plains. 2-4 p.m. Thru April except for November when it will be on the first Wednesday. Hosted by The Bristal Assisted Living for residents in Westchester suffering from dementia, Alzheimer’s Disease and other memory loss as well as their family members and caregivers. Light refreshments and entertainment will be provided in a support group atmosphere. For information call The Bristal at 914/681-1800.